In an ever-changing marketplace, Belfast-based Barrett Group is one local business which is always a step ahead when it comes to meeting the needs of estate agents. Set up in 1989 by Brian Barrett, there is a team of 25 employees dealing with over 180 estate agents in Northern Ireland. Its cutting-edge and all-encompassing provision includes everything from an easy-to-use online service to order residential or commercial ‘for sale’ or ‘to let’ advertising boards, to providing the latest LED shop window displays, vehicle branding or entire shop fit outs. 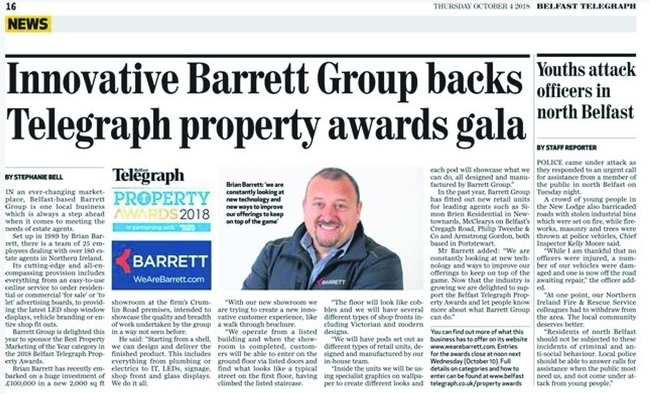 Barrett Group is delighted this year to sponsor the Best Property Marketing of the Year category in the 2018 Belfast Telegraph Property Awards. Brian Barrett has recently embarked on a huge investment of £100,000 in a new 2,000 sq ft showroom at the firm’s Crumlin Road premises, intended to showcase the quality and breadth of work undertaken by the group in a way not seen before. He said: “Starting from a shell, we can design and deliver the finished product. This includes everything from plumbing or electrics to IT, LEDs, signage, shop front and glass displays. We do it all. “With our new showroom we are trying to create a new innovative customer experience, like a walk through brochure. “We operate from a listed building and when the showroom is completed, customers will be able to enter on the ground floor via listed doors and find what looks like a typical street on the first floor, having climbed the listed staircase. “The floor will look like cobbles and we will have several different types of shop fronts including Victorian and modern designs. “We will have pods set out as different types of retail units, designed and manufactured by our in-house team. In the past year, Barrett Group has fitted out new retail units for leading agents such as Simon Brien Residential in Newtownards, McClearys on Belfast’s Cregagh Road, Philip Tweedie & Co and Armstrong Gordon, both based in Portstewart.